Please read all rules before buying from or trading with me. Thank you! I apologize if I sound like a pony Nazi, but you've gotta do what you've gotta do ^_^. 1. I reserve the right at any time to refuse a sale or trade for any reason that I deem worthy. For example, if you fail to provide me with adequate references, or if anything seems 'fishy' or suspicious at any time. 2. I will NOT send an item that you have bought from me unless I have received payment in full for the item and shipping costs. The end. 3. When trading, you must provide me with adequate and reliable references in order for me to send you trade items first, or at the same time. I WILL contact your references and post on message boards to find out about your reliability. If you have very few, or no references then I will expect for you to send first. If you need to verify my references, please check my references page. Feel free to request e-mail addresses from me for the listed references and to e-mail them to ask them about their experiences with me. Ask around about me on message boards. Do what you feel you need to do to protect yourself. 4. I only accept cash in U.S. funds and/or cashiers cheques and money orders that can be cashed in the U.S. I do not accept personal checks, so please don't try it. 5. I will always try to describe the item that you are buying from, or trading with me as best I can. I am an EXTREMELY picky collector, so please be assured I will point out even the most minute of flaws (this includes hair cuts, frizz, tail or mane rust, missing or rattling washer, ink marks, rust marks, vinyl flaws, smooze, pony cancer, any unidentifiable marks, symbol rubs, blush rubs and eye rubs). The only thing that I do not consider to be a flaw when examining a pony is if the glue seal binding the head to the body is broken. If this is a problem for you, let me know and I will check for it ^_^. 6. If you need a picture of a pony you are buying from or trading with me, just let me know! Please know that I do not always have access to the scanner that I use, so please have patience with me ^_^. 7. For U.S. sales, I send U.S.P.S. priority mail with delivery confirmation, which is 40 cents extra. If you would prefer another method (i.e. first class) and/or would like your ponies insured, please let me know. I will not negociate about delivery confirmation, this rule is set. This is due to the .001% of pony traders or buyers who will stoop to saying that they have not received their ponies when they actually have (scammers!). If you live outside of the United States, please let me know when you contact me. We will work out shipping costs at that time. 8. When trading, I will pay all shipping costs to send the items to you, and hope that you will extend the same courtesy to me. 9. I wrap items extremely well so that they will not be damaged. Therefore, it may be necessary (but not definite) to equate packaging costs into the total amount when making a sale. I will be sure to break down costs for you so that you can see what you are paying for if it is necessary to add extra packaging costs. I will not send in bubble envelopes. 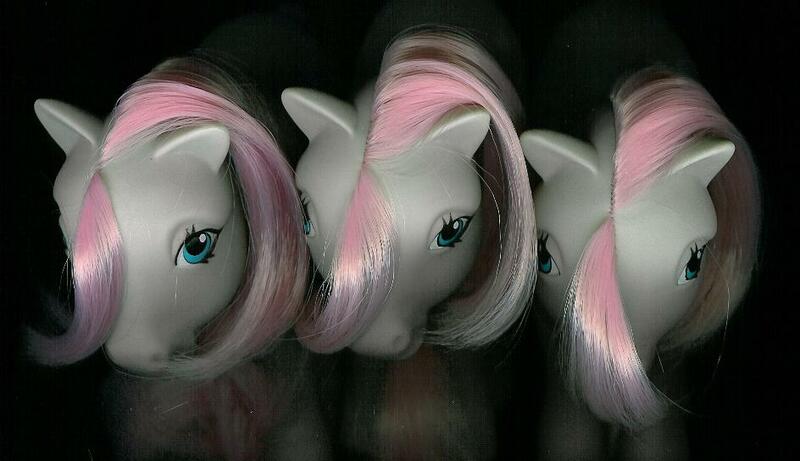 I have had ponies sent to me that were damaged that way, and want to prevent it from happening to you ^_^! 10. If at anytime, you have a comment or complaint regarding sale or trade items, please let me know! I'm a reasonable person and I want you to be happy with your ponies! I'm sure we can work something out if you are not satisfied for any reason. Thank you for reading over the rules! I hope to hear from you soon ^_^.